The veteran of F-Zero fame has returned to the fray, this time, with his Blue Falcon at hand. When the Raptor Boost is used in the air it immediately sends opponents flying to the ground, if it connects. The trick is using this to your advantage, it can work to edge-guard, as it can plummet the foe straight down. If it misses or the target air-dodges, Captain Falcon charges straight off the stage's edge, plummeting to his death. He also excels with his throw combos, which makes it easy to set up combos. Every now and then set up a good 4 or 5 downward throws at once without letting your opponent recover from them too much. The last thing is: Falcon punch is good when you have the chance. Don't go throwing out Falcon punch every second move; wait until you get the chance. One way is to use the Falcon Punch for edge guarding. Knock someone off the stage, then try to Falcon Punch them as they return. Also, if you push backwards right after starting a Falcon Punch, you will cause the Captain to turn around and punch behind him. This could be used to fake out your opponents. + + + + Falcon Axe Captain Falcon does an axe kick. + + + + Knee Smash Falcon knees his opponent. If this attack hits at the very beginning in the right spot it is a powerful electrical blast that sends opponents far. Otherwise it's just a weak tap. + + + + Falcon Stomp Falcon thrusts his legs downwards. This attack can meteor smash. If you tilt the Control Stick backwards while this move charges, he'll turn around and perform it in that direction instead. Doing this makes it slightly more powerful, but also takes slightly more time to charge. This is Captain Falcon's main recovery move; He'll leap into the air and attempt to grab an opponent and deal fire damage to him/her. This is notable for being an aerial grab attack, which can be surprisingly useful to capture shield-users on different platforms. He charges up with a fiery aura. + He salutes and says, "Show me ya' moves!" 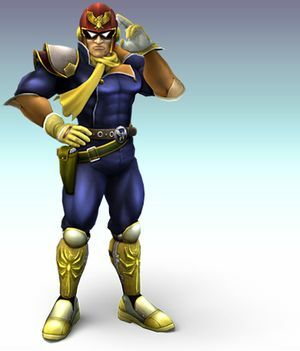 Blue Falcon: Captain Falcon summons his Blue Falcon in front of him to hit any number of opponents. 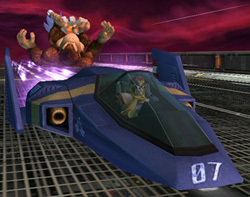 Captain Falcon then teleports his victim to an unknown track and rams them with his car, the Blue Falcon. The attack causes very high knockback, often a one-hit KO if the opponent has a medium damage level. However, this only works if he hits someone when summoning his car. He is the only character with a cinematic final smash. Strangely, it will delete all items on screen. This page was last edited on 5 March 2013, at 21:34.